Our less common Euphyes skippers, the Black Dash, the Dion, and the Two-spotted, are all wetland-habitat species, and probably arrived here during the postglacial warming period (xerithermic), when glacial lakes and kettle ponds across New England and upstate New York succeeded to marshes, swamps and bogs, allowing these species to recolonize the area from their southeastern refugia. As Arthur Shapiro has suggested, recolonizers of marshy areas probably also included the Broad-winged Skipper sub-species Poanes viator viator, and Mulberry Wing, Poanes massasoit. All these marsh species may well have reached the Great Lakes area via a route through southern New England and New York (Shapiro 1970b, incl. maps). The present disjunct between the Atlantic coastal populations and the Great Lakes population is ascribed to the subsequent drying up of the central New York marshes. There are no phenotypic differences between eastern and mid-western Black Dash, except for the darker Nebraska sub-species buchholzi. Like the Mulberry Wing, with which it is often found, Black Dash occurs only in eastern North America, and has a small and rather unusual range. It occurs along the northeastern seaboard, from Massachusetts south only to Virginia. North of Massachusetts, it is found in only a few locations in southern New Hampshire and southern Vermont (VBS 2002-2007), but it has not been found on the ongoing Maine Butterfly Survey (MBS 2013). This southern New England/mid Atlantic population is widely separated from another identical population around the Great Lakes and upper midwest. W. H. Edwards called one of his two specimens of this species Euphyes pontiac, naming it for a powerful Native American chief in the Great Lakes area, and in old sources Black Dash is still sometimes referred to as the Pontiac Skipper. As Zirlin relates, Edwards actually described the same species twice, thinking his two specimens were of different species. But because conspicua appeared on the page preceding pontiac, the name conspicua was given priority and applied to the species as a whole (Zirlin 1995). For Massachusetts Scudder (1889: 1732-4) wrote that Black Dash had been reported only from the Boston area---Cambridge, Jamaica Plain (Boston), Malden and Wollaston (Quincy). Twenty-three F. H. Sprague specimens from Jamaica Plain, Malden, Milton and Wollaston, collected between 1883 and 1896, are in the Harvard MCZ, and other early specimens from Malden (L. W. Swett, c. 1908) and Milton (H. H. Newcomb, 1899) are at Boston University. Clearly Black Dash was not rare in the east, even though Thaddeus Harris" 1820-1850 Boston area collection did not have a specimen (Index). As for western Massachusetts, Sprague reported collecting it in Belchertown and North Leverett in 1878 (Sprague 1879), but the current location of these specimens is unknown. Still, like Mulberry Wing, Black Dash was probably present in western Massachusetts. As with Mulberry Wing, one can hardly find Black Dash in Scudder's Boston area towns today, since they have become so heavily urbanized. And again like Mulberry Wing, Scudder did not seem to know this butterfly very well. It is not even on his earlier 1862 list of New England butterflies. 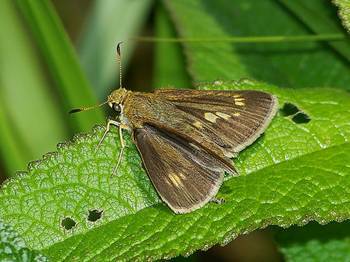 Following Edwards, he called it Limochores pontiac, or the Pontiac Skipper, but was able to give no information about its life history, host plants or habitat. Black Dash, like Mulberry Wing, was probably uncommon throughout Massachusetts in the 19th century. It was certainly nowhere near as common as its more versatile wetland-based congener, Dun Skipper. Also like Mulberry Wing, Black Dash probably suffered greatly from the loss of wetlands, both during agricultural development 1600-1900 (Table 1), and later owing to urban and suburban development in the twentieth century (Table 2). By the 1930’s, Farquhar (1934) is able to add Stoneham, Newtonville and Norwood to the list of towns where Black Dash had been collected, widening it’s known range around Boston. C.V. Blackburn's 1927 Stoneham specimen (female) is now in the Boston University collection; four 1925 Norwood specimens are in the MCZ. In 1936, C. L. and P. S. Remington took fifteen specimens from the Blue Hills in Milton, and one from North Weymouth In 1946 W. P. Rogers collected Black Dash in Fall River, in 1950 C. P. Kimball collected it in Barnstable on Cape Cod, and in the 1960's C. G. Oliver collected it in Acton Center and Littleton (Yale Peabody; MCZ). Black Dash was first documented for Berkshire County in 1962: O. R. Taylor's Richmond specimens are in the Yale Peabody Museum. In 1986 it was again documented for the southern Berkshires (Sheffield, 7/18/1986, D. F. Schweitzer, specimen at Yale), and the Atlas had one central Berkshire record (8/1/1989, Richmond, S. Roble). Black Dash was not known to occur on Nantucket in the 1940's (or today), but on Martha's Vineyard F. M. Jones reports finding it in a bog in West Tisbury, July 28 and 30, 1942 (Jones and Kimball 1943). By the 1970’s Lepidopterist Society records for eastern Massachusetts add additional information. In 1971 Edward M. Peters took a conspicua male specimen in Carlisle; in 1973 William D. Winter reports conspicua “quite common” in Westwood, Dover and Medway 7-24 July; and in 1974 Darryl Willis reported it “common” in the Holliston/Sherborn area (Lep. Soc. Seas. Sum. and Correspondence, 1959-1981). Five William D. Winter specimens from Dover and Medway (1966, 1973, 1974) are in the Harvard MCZ and two Ingraham specimens from Dover are at Yale. The main larval host plant for Black Dash is tussock sedge (Carex stricta), which is native to and found in all counties in Massachusetts (Cullina et al. 2011; Magee and Ahles 1999). The 1995-99 Connecticut Atlas participants found eggs or larvae of Black Dash on this species in the wild (O'Donnell et al. 2007). However, Black Dash may also use some of the many other available sedge species. Research is solely needed. Like Mulberry Wing and Two-spotted Skipper, Black Dash is a localized marsh-grass feeder, and not an active colonizer. But compared to Mulberry Wing, it uses a somewhat wider range of types of wetlands, including weedy streamsides, fens, and wet meadows, and is somewhat more likely to leave these habitats in search of nectar (Cech 2005). Black Dash will persist in shrubby or partially wooded (red maple) wetlands in which tussock sedge is at least co-dominant, but the species does not occur in deeper shade (NatureServe 2010). Succession of wetlands to wooded swamps will reduce Black Dash populations. There are locations in Massachusetts where Black Dash was known, but is not found today, because the wetland has been overgrown with shrubs and saplings. MBC yearly records of sightings per number of trip reports show a trend toward decline in this species (Chart 105). The reading for 1993 is especially high owing to an unusually large number (212) reported from one site in Easton. (In all other years the largest number from any one site or even from a NABA Count does not exceed 30.) Even if that report is left aside, there is still a downward slide in sightings over this time period. Moreover, list-length analysis of these same 1992-2010 data showed a statistically significant 61.6% decline in Black Dash over these years (Breed/Stichter/Crone 2012). Mulberry Wing also showed a significant (39.9%) decline. Black Dash’s state distribution (Map 105) is remarkably similar to that of Mulberry Wing. 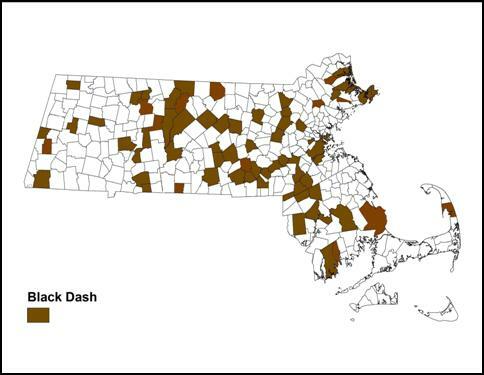 As of 2013 Black Dash is reported from only 69 of a possible 351 towns in Massachusetts, and Mulberry Wing from only 73 towns. Map 105 shows Black Dash to be fairly common throughout the east (except Cape Cod) and the central parts of the state, and "the valley" -- and present but uncommon in Berkshire County. This is a different picture from that of the twenty-year-old 1986-90 Audubon Society Atlas, which found Black Dash "fairly common" only in eastern Massachusetts and "uncommon, yet present, in widely scattered locales to the west." The Atlas had only one record from Berkshire County (Richmond) and two from Franklin County (Deerfield, Gill). Cape Cod: The Atlas did not find Black Dash on Cape Cod, and there is apparently only one historical record (Barnstable, 1950). Mello and Hansen say that the Dennis/Greenough Ponds Complex in Yarmouth “marks the only location on Cape Cod that hosts the Black Dash,” but they do not cite any specific records (2004: 92). In 2013 Black Dash was finally documented for Cape Cod at MAS Wellfleet Bay WS, Wellfleet, by Mark Faherty (photo available at http://www.flickr.com/photos/pajarero/9351249271 ). This confirms an earlier 2005 MBC sight report from this location. Martha's Vineyard: There are no BOM-MBC records from otherwise well-reported Martha’s Vineyard, suggesting that Black Dash is, like Mulberry Wing, unlikely to be found there, despite F. M. Jones' 1942 report. The Atlas did have one record from Martha’s Vineyard (W. Tisbury, 7/29/90, C. Leahy), but the current Vineyard checklist lists Black Dash as “rare or extirpated” (Pelikan 2002). Southeastern Massachusetts: Black Dash has been reported nearly every year 2003-2008, and also in 2011, in small numbers from the Bristol NABA Count, which is centered in south Dartmouth. In contrast, only one Mulberry Wing has ever been reported on the Bristol Count. The Atlas and BAMONA also show Bristol County records. But there were no Plymouth County records until 2013, when Black Dash was finally located in Plymouth at Tidmarsh Farms by M. Faherty (1 individual, photo available). Overall, Black Dash appears to be uncommon in southeastern Massachusetts, but is more easily found than Mulberry Wing, which may be completely absent. Central Massachusetts and "the valley"; BOM-MBC records show Black Dash in more parts of central Massachusetts than had been previously thought. There are reports from Greenfield, Gill, New Salem, Orange, Royalston, Petersham (Tom Swamp), Princeton, Paxton, Shutesbury, Wales (Norcross WS max 2 on 7/19/2006 E. Barry et al. ), Amherst, Ware, East Longmeadow, and other towns. Black Dash is reported nearly every year on the Central Franklin NABA Count, in numbers varying from 1 to 30. Since 2001 it has usually been reported on the Northampton NABA Count, in numbers less than 10, and since 1996 on the Northern Worcester NABA Count with numbers varying from 1-20. Berkshires: Black Dash has been found on all three Berkshire NABA Counts, although usually in numbers less than 10, and the species appears much less common in the Berkshires than in other regions of the state. It has been reported only from North Adams in the north, and Cummington, Hinsdale, Richmond, Stockbridge, and Sheffield (South Berkshire NABA). Eastern Massachusetts: Good numbers and frequent reports continue to come from the more eastern NABA Counts. The Blackstone Valley Count has reported Black Dash nearly every year since 2001, with numbers varying from 1-18 (towns include Grafton, Sutton, and Upton); Concord NABA has reported it nearly every year in numbers varying from 1-14 (towns include Acton and Sudbury); and Foxboro had it nearly every year in the 1990’s, in numbers varying from 1-23.
Notable and productive locations include Athol Branch Bridge Road, 50 on 7/11/2011, F. Model; Easton, 212 on 7/17/1993 B. Cassie; Ipswich Appleton Farms TTOR, 11 on 7/7/2012, S. Stichter, R. Hopping, H. Hoople; Milford power line, 8 on 7/18/2004 E. Nielsen; Milton Fowl Meadows, 5 on 7/28/2012, M. Arey; Rockport rail line behind Babson Museum, 30 on 7/25/2004 D. Savich and C. Tibbits; Sherborn gas line, 29 on 7/5/2010 B. Bowker; Sherborn power line, 27 on 7/11/2008 B. Bowker; Sutton Whitinsville Lasalle Rd., 9 on 7/10/2011, E. Barry; Upton Robertson's gas line max 4 on 7/4/1999 T. and C. Dodd; Ware, 16 on 7/11/2010, B. Klassanos. Both Black Dash and Mulberry Wing are vulnerable to natural succession in wetlands. One colony of Black Dash in a small wetland adjacent to a commuter rail line in Rockport was monitored every year 1993-2009 by D. Savich and C. Tibbits. Numbers at this location (the only known site for this species and Mulberry Wing on Cape Ann) have varied greatly, but with an overall downward trend as the wetland has succeeded to shrubs. The highest numbers of Black Dash at this site were 26, 18, and 30 in 2002, 2003, and 2004, but 8 in 2005 and 0 to 2 after that. NOTE TO COLLECTORS: BLACK DASH IS A REGIONALLY UNCOMMON, SPECIALIZED, AND POSSIBLY DECLINING SPECIES IN MASSACHUSETTS. IT SHOULD NOT BE COLLECTED EXCEPT FOR SCIENTIFIC RESEARCH UNDER THE AUSPICES OF AN EDUCATIONAL OR SCIENTIFIC INSTITUTION. Like the Mulberry Wing, Black Dash is univoltine throughout its small range, and has a relatively concentrated flight time in Massachusetts, from mid-June to mid-August, with peak numbers in the middle two weeks of July. Good numbers are actually seen in many locations during the first week in July (http://www.naba.org/chapters/nabambc/flight-dates-chart.asp). Earliest sightings: In the 23 years of BOM-MBC records 1991-2013, the six earliest "first sightings" are 6/17/2013 Mattapoisett Nasketucket, J. Dwelly; 6/17/2003 Royalston C. Kamp/MBC; 6/18/1995 Amherst M. Fairbrother and D. Case; 6/19/2005 Petersham Tom Swamp B. Benner and T. Gagnon; 6/24/2012, East Longmeadow, K. Parker, and 6/25/2000 Hubbardston Barre Falls Dam M. Lynch and S. Carroll. In these and one other year, the first sightings were in June, not July. BOM-MBC reports suggest that this species may be flying earlier now than it did in the past. A century ago Scudder cites July 10 as his earliest specimen date (1889: 1732-4). The Atlas early date had been July 6, 1989. However, in seven of the 23 years 1991-2013, the first sightings of Black Dash are in June, and another 12 are from the first week in July (7/1-7/7). In only four of the 23 years has the first sighting been as late as the second week in July. Latest sightings: In the same 23 years, 1991-2013, the six latest "last sightings" are 8/10/1994 Rockport D. Savich and C. Tibbits; 8/9/2004 Chelmsford T. Whelan; 8/8/1992 Easton T. Dodd; 8/6/2006 Rockport D. Savich and C. Tibbits; 8/6/1993 Easton T. Dodd; and 8/5/2011 Stockbridge, M. Arey. The Atlas late date was 8/10/1986 Sharon, B. Cassie. Black Dash’s flight has extended into early August in at least 15 of the 23 years under review. A century ago Scudder’s latest flight date was July 27, and while that date was probably simply the result of his limited number of specimens, it is also possible that Black Dash's flight time has extended somewhat with climate warming. Black Dash should be a Species of Conservation Concern in Massachusetts, due to habitat specialization, limited continental range and susceptibility to climate warming. Like the Mulberry Wing, but unlike the Two-spotted, Dion and Broad-winged Skippers, the Black Dash’s range is limited in the east to the southern New England/mid-Atlantic part of the east coast, and does not extend southward along the coastal plain. Thus Black Dash and Mulberry Wing may experience range contractions at the southern edge of their range, as well as possible expansions northward, if climate warms. How this would affect Massachusetts populations is not clear. (Species affected by climate warming are listed on Table 6). Habitat loss is the more salient threat. Black Dash is “only slightly less specialized than Mulberry Wing” (Cech 2005), and the preservation of open wet meadow habitat in Massachusetts is critical to the survival of this univoltine sedge-feeding species. Much wetland and sedge meadow habitat has already been lost in this state as a result of urban and suburban development. Natural succession in wetlands is also a threat. Current wetland protection laws may be critical for remaining populations of Black Dash, but documentation at many likely locations is lacking, and wetland management may be necessary. Black Dash’s eastern range coincides with some of the most heavily urbanized areas of North America. Still, it has managed to survive. NatureServe (2012) optimistically ranks it S4 or “apparently secure” in its strongholds of Connecticut, Massachusetts and New Jersey, but S3 or “vulnerable” in New York and Pennsylvania. In Vermont Black Dash was first documented in a few (now 8) southern survey blocs in 2003, and is a species of special conservation concern (VBS 2010). This species has not been found in Maine, and eastern populations are disjunct from Great Lakes populations.